OXFORD, Miss. – For Edgar Serrano, the Spanish language is a tool. More than just a way to strengthen their language skills, foreign language instruction is one of many tools Serrano hopes students receive to help make the world a better place. That passion for teaching Spanish to college and elementary students resulted in national recognition. 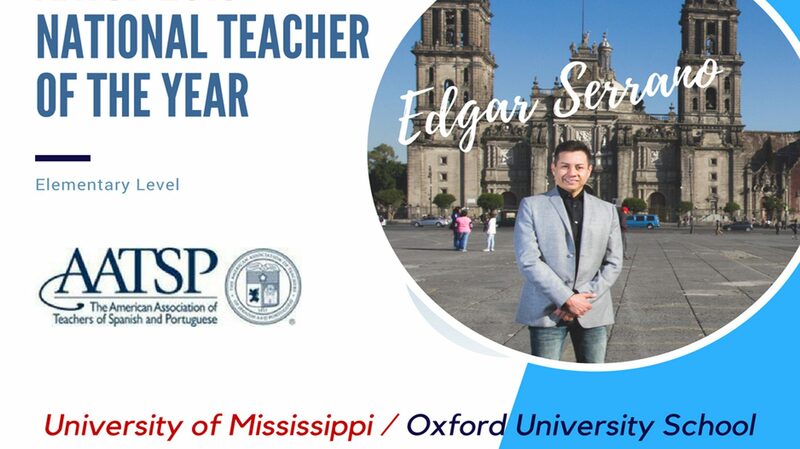 Serrano, an instructor in the Department of Modern Languages at the University of Mississippi, has been named the 2018 recipient of the American Association of Teachers of Spanish and Portuguese Outstanding Teacher of the Year Award. “Being honored makes me proud of my decision to teach and help impact young learners,” he said. “It also means that there is a light at end of the tunnel, and that it is never too late to start a new career. Serrano is both a college-level instructor at UM and an elementary Spanish teacher at the Oxford University School. He was recognized for his work with elementary students at the AATSP conference held in Salamanca, Spain, in June. The AATSP, founded in 1917, promotes the study and teaching Spanish and Portuguese languages and culture throughout all levels of education. The organization collaborates with educators on programs and research projects so students can develop a better understanding of the Spanish- and Portuguese-speaking countries of the world. Originally from Mexico City, Serrano worked in international sales for more than a decade. In 2009, he returned to college to earn a master’s degree and began teaching language in 2011. He teaches basic and intermediate Spanish at the university and third through eighth grades at OUS. Serrano’s work makes Oxford a more vibrant community and supports the university’s strategic goal of educating and engaging global citizens. “I have always loved culture, travel and foreign languages, and I felt that I could make an impact in the lives of students by encouraging them to explore the world,” he said. Serrano began teaching young children in 2011, and he said the challenge has been rewarding. He said the children have been very receptive in learning another language. “They absolutely love it,” he said. “Parents tell me that their kids are always using the language by counting, singing the days of the week, or by playing with their toys and teaching them Spanish. For them, it’s so natural and simple like playing. To keep younger students engaged, he introduces songs, videos and activities including role-playing, puppet shows, story time, yoga, scavenger hunts and travel experiences. Students are given positive feedback and assessed on the readiness standards of communication, connection, comparison, culture and community. His students also take an active role in their language lessons by creating stories and art projects and asking questions about Spanish-speaking countries. Serrano is making Mississippi a better place by teaching young students, said Dan O’Sullivan, chair and professor of modern languages at Ole Miss. Serrano has a passion for teaching and feels he is making a difference in the lives of his students.